Do you remember this little raincoat I made out of a vinyl tablecloth a few weeks ago? I was talking to my cousin Jess not too long after I posted these pics and we got to talking a little. She owns a hair salon and is constantly wearing an apron to protect her clothes from all the color she uses on her clients hair. Only problem is she is tall, so all of her color aprons are too short and she ends up with color all over her pants. And the other problem is they are mostly black, which is boring. All in all, her options were less than awesome. Well after discussing the merits of vinyl tablecloths and doing a little test run on a scrap (to make sure that hair color would come off vinyl) she asked me to make her an apron out of the rest of this floral vinyl. And you know how I am about making things reversible (skirts, other aprons), so we found another vinyl tablecloth, red to go with the flowers, and after drafting a pattern on sheets of freezer paper, here’s what I made. Number 1– When sewing at top speed down a long straight seam the heat generated from the friction of the needle going up and down will melt the vinyl, which leaves some nice melty residue on your needle. So you need new needles. Number 2– Making long skinny apron ties from cotton backed vinyl is NOT a good idea. Because of the cotton which catches on itself, and the thickness of the vinyl it is impossible to turn them. Seriously, impossible. And I didn’t want any raw cotton edges to show because she works in a hair salon. And not only is it tacky, but little hair trimmings will stick to any cotton edge and that is just gross. Number 3– Due to the plasticy nature of vinyl, it’s also not an option to iron/press those edges under and then topstitch. Also due to the non-healing nature of vinyl, if you use pins then you end up with little permanent pinholes everywhere. You can see where I’m going with this, right? After some serious frustration I sat down to think. And it took a while for the frustration to subside and for inspiration to strike, which is why this apron spent two weeks in pieces on the dining room table. How was I going to get this slippery vinyl to stay where I put it long enough to sew it down without melting plastic or making permanent pin holes. Answer? Super Glue. It was a brilliant idea. One of my best ideas yet. I used little/medium sized dots of superglue to hold everything I would have used pins for. The superglue is strong enough to hold that thick vinyl tight and dries fast enough for me to not go crazy with waiting. Also, when it’s dry it isn’t sticky so my needle didn’t get gummed up with adhesive. (Just with the melted vinyl I mentioned in #1.) On one side of the apron is a pocket and the other side has three loops where she can stash her scissors, combs, etc. I superglued the pocket down before I stitched it in place. And then I superglued those fabric loops before stitching them down as well. On the loops I stitched a box with an X inside it on each side of each loop to give it a little more strength. And I superglued some extra fabric interfacing behind it to try and keep the stitches from ripping through the vinyl. I am not sure how well the vinyl will hold up with daily use. I guess we’ll have to see. But Jess, I hope you enjoy your new color apron! I’m adding this to Sew&Tell at Amy’s. That is so excellent (and I’m sure, worth a few more pink streaks in trade?!). Great ideas as always here on PSS. So cute! Love the raincoat AND apron! It’s awesome! I love the colors. I was sewing with clear vinyl last night and it was really annoying, so I can empathize! That is one seriously awesome apron! Wow! You are the queen of repurposing! We seriously need to get together! that is so blasted clever! I love the raincoat and the apron is just way too cool! LOVE the apron. wish I’d thought of super glue when I made one last summer. Next time!! And this is why I used bias tape on my edges of my smocks, and for my ties. 🙂 Glad you figured it out, though. And you must sew FAST! My machine doesn’t go fast enough to melt vinyl. I think I need to get it serviced. Super cute! And wow at your patience. I would have given up when the melting started. Of course, I also have a hate/hate relationship with my sewing machine. It’s not the machine, it’s me! Your talent astounds me… and makes me a little green with envy! I hate turning out any strings I make out of any fabric,such a pain. I sew vinyl with my industrial machine which has a walking foot,it glides through and I always sew strings and straps on the outside.Lifes too short for frustrations like that..
That is absolutely brilliant! The apron is awesome! and yet again, you amaze me! Wow! Who knew you could get so much out of those vinyl tablecloths!!!! I just made like five bags out of laminated cotton. When my presser foot and feed dogs started to act up, I just laid a strip of Tissue paper (wrapping gifts) both under and on top of the stitch line. Stitched like a dream, then the stitching made the tissue tear right off. Can’t even tell that I did that. I also used this technique when I made aprons out of Ripstop nylon for the lady who does my nails. The straps were a bear, but they are holding up nine months later. Ripstop might be another choice if you make her more aprons. Comes in nice solid colors. My Joann’s sells ripstop right next to the duck cloth. 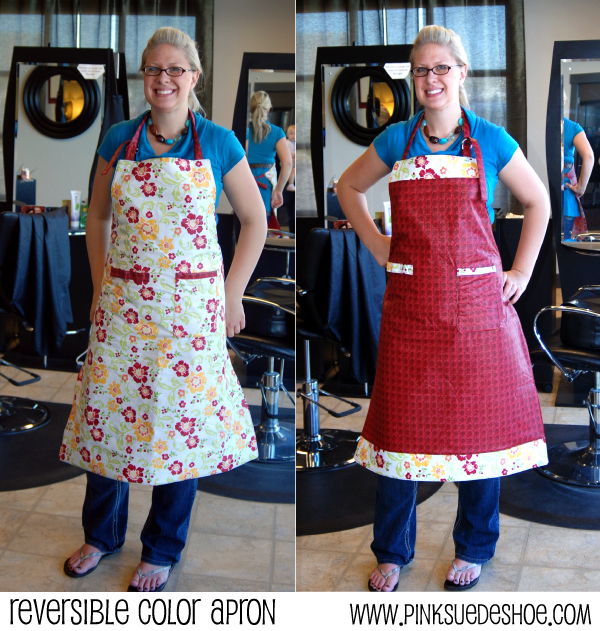 Super reversible apron! Thanks for the tips on using vinyl. They look great! Much more interesting than plain black. Very cute! The super glue idea is genious. wow! thanks for doing all that work so that now WE know how to make one of those CUTE aprons!! Great job! You are so smart! I would have never ever thought to use super glue. The apron is lovely. You did a lovely job. 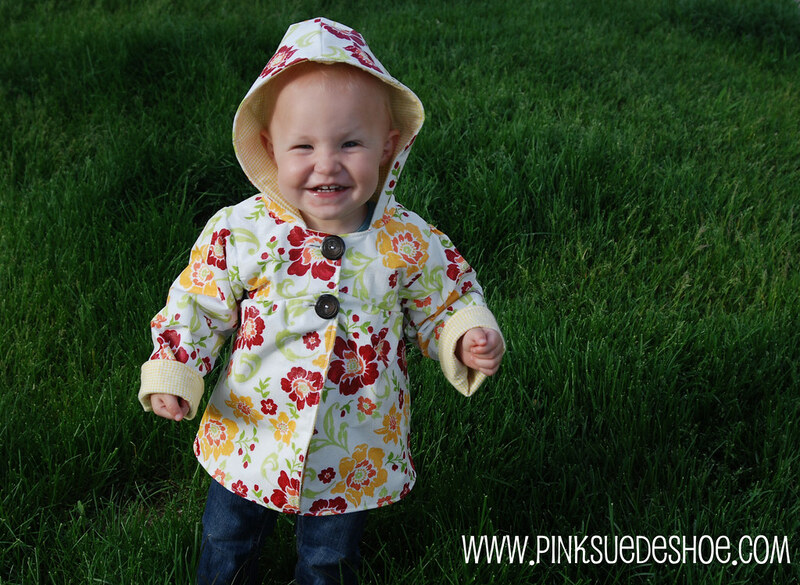 I can’t get over how cute Creamie is in that raincoat! I sew with duct-tape…is that the same thing? I barely realized that you had blogged about the making of this lovely apron! I feel Awful it was such a Pain! I ABSOLUTELY love it though! And so do my clients! I get compliments on it daily, and I basicly tell them My cousin kicks A$% at sewing! Thank you Again!! You are so talented! I would LOVE to know how well these stood up!? I’m thinking of making a bean bag newborn poser and using a vinyl tablecloth so it will be water resistant! but I’m afraid to waste the time/money and then have to start all over! They held up pretty well actually. But not if you wash them in a washing machine. For the aprons they just needed to be wiped off so they wouldn’t stain. They didn’t need to really be “clean”. If you put them in the washing machine the colors fade really bad, and the fabric, even though its vinyl, doesn’t hold up very well. Small tears happen really easily. For something you’ll probably need to wash frequently you might try a laminated cotton. It might hold up better. These vinyl tablecloths are great for an art smock, but I wouldn’t snuggle a newborn in one either. They are hot, completely unbreathable, and not very soft either. Maybe if you made it out of vinyl and then had a removeable washable cover on top of that? That way you could have the convenience of a washable cover, a water resistant form and you could still have something soft and breathable next to your baby. Good luck!